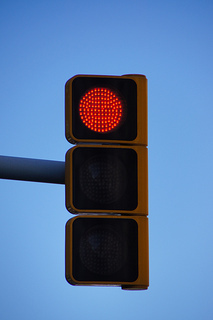 Ask even a kindergartener and they can tell you – A green light means “Go” and a red light means “Stop.” It is a simple, straightforward rule and yet it is frequently violated. In some cases, drivers aren’t paying attention and simply don’t notice the change. In others, an impatient driver tries to sneak through a yellow but it has turned to a definite red by the time the vehicle moves through the intersection. Regardless of how it happens, red-light running is dangerous, can cause serious injury/fatality, and brings Californians to our San Francisco car accident law firm seeking civil redress. On Saturday morning, according to a California Highway Patrol report and The San Francisco Chronicle, running a red light caused a woman to die and led six others to suffer injuries. Witnesses said the woman drove through a red light as she travelled west on Marsh Creek Road. As she did so, at around 9:30 A.M., her Dodge Charger was broadsided by a minivan that was proceeding south from Highway 4 onto Vasco Road. Emergency responders airlifted the female Charger driver to Walnut Creek’s John Muir Medical Center where she succumbed to her injuries. She was reportedly in her 40s or 50s and was not the car’s registered owner. A separate helicopter transported a man and a pregnant woman, both from the minivan, to John Muir Medical with severe injuries. Four children who had also been in the minivan were taken by ambulance to Children’s Hospital Oakland for treatment of minor or moderate injuries. CHP is investigating, including looking at whether alcohol or distracted driving played a factor. Witnesses are asked to call the CHP. In a page focused on red-light running, the Federal Highway Safety Administration (“FHSA”) recognizes that running red lights produces “a serious intersection safety issue” nationwide. Relying on 2008 data, the National Highway Traffic Safety Administration (“NHTSA”) found there were more than 2.3 million intersection collisions reported, including approximately 733,000 injury crashes and more than 7,770 that were fatal. More specifically, the NHTSA’s Fatality Analysis Reporting System (“FARS”) concluded that red-light running alone resulted in least 762 red-light fatalities in 2008. Red-light running also leaves 165,000 people injured annually. The FARS statistic uses local laws to define red-light running. Some jurisdictions use a “permissive yellow” rule where it is a violation if the driver enters an intersection after the light turns red (i.e. driver may enter the intersection on yellow and may be in the intersection during red if the driver entered on yellow). Others use a “restrictive yellow” rule the driver must fully clear the intersection when the red begins. Notably, an Insurance Institute for Highway Safety (“IIHS”) review found that half of those killed due to red-light running were not the violators themselves. A third of those interviewed admitted knowing someone who was hurt or injured in a red-light running accident, even though statistics show this number should be higher. Additionally, 97 percent of drivers agree that other drivers cause a threat to public safety by running red lights. Another FHWA fact sheet, notes that 93 percent believe it is unacceptable to run a red light. Unfortunately, they don’t appear to extend this rule to themselves – one-third admitted to running a red light in the last thirty days alone. Red-light running is both common and dangerous. The FHWA makes this clear, noting that Americans are more likely to suffer injury due to a crash involving red-light running than any other form of crash. If you are one of these victims, call our San Francisco injury lawyer. We will work with you, acting as your guide and your advocate as we work toward helping you recover money damages.